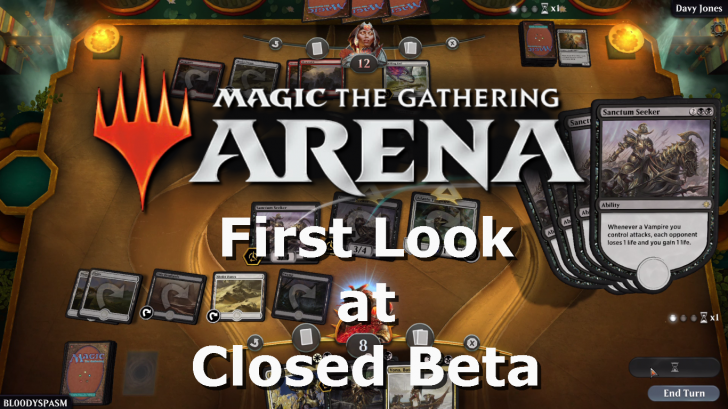 I received some exciting news a few days ago: Wizards of the Coast has dropped the NDA on the Magic The Gathering Arena Beta, so I can finally share some screens and opinions with you. 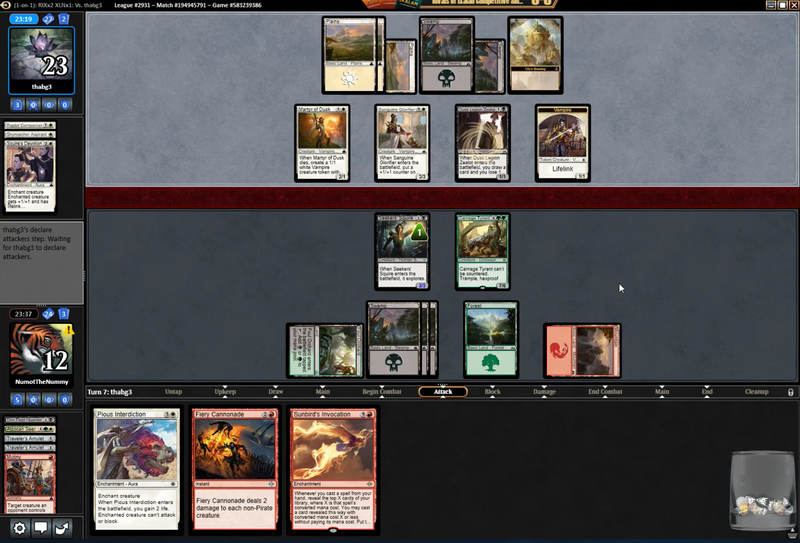 I’ve been playing Magic the Gathering for about 17 years now and I’ve tested almost all of their digital products from Shandalar to MTG Duels and MTG Online and I hated to see how the presentation of their videogames always felt a few steps behind the competition. 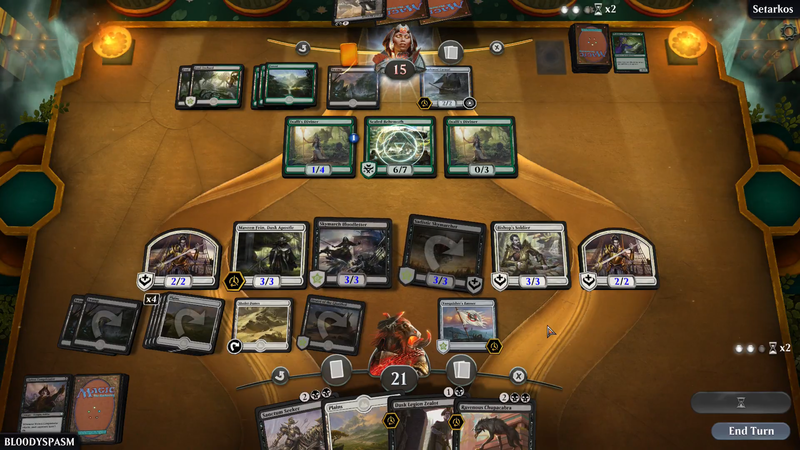 It’s understandable that Magic is a more difficult game to encode, as the rules are much more complicated than any other virtual Collectible Card Game (CCG) offerings, mainly because it uses what we call “the stack”: a place where each ability and spell gets added to and which allows any player to react to it whereas games like Hearthstone only allow you to play spells and creatures in your own turn. The stack. friend or foe? This does make Magic a more interesting game to play though, and it certainly allows for a lot of effects and cardtypes that do not even exist in other games. Added to this is Magic having the largest library of existing cards in existance, with well over 15.000 unique cards! For this Closed Beta however, we are limited to playing with the most recent sets (each set has around 200-300 cards) and they will keep adding new cards as they come out. I just hope they will also go back in time and add the older cards as well. And it looks like we’ll never be limited in how many deck slots we can add (unlike some other CCG’s that make you pay for this) The presentation of this interface is very clean and you’ll even be able to import decks from other players (if they’ve shared it online) or export your own so others can test your list of 75 cards. 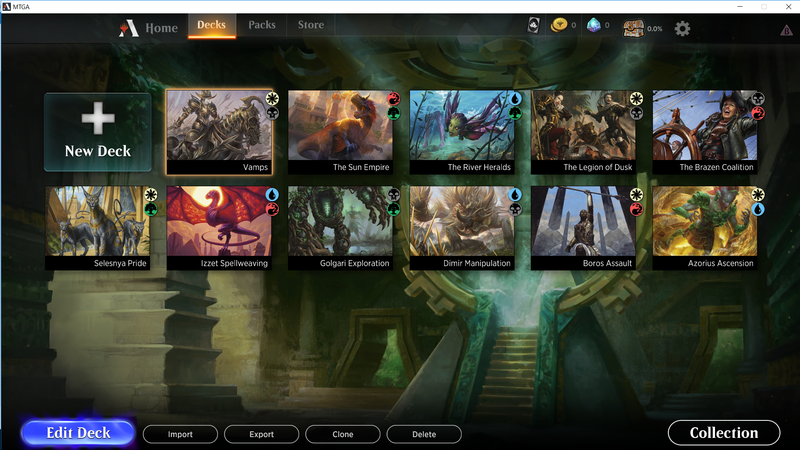 What would be amazing is if they add in drafts and sealed deck: instead of making your own deck out of a collection of cards, you can play a game of “limited”, in which you do not yet know which cards you’ll get. The first Limited gametype is “Sealed”: you open 6 boosters and make a 40 card deck out of it. The Second Limited gametype is “Draft”: Players each open a 15 card booster pack, take out on card and pass it to the player next to them. This process gets repeated until all 3 boosters are drafted and you can build a 40 card deck out of it. Personally I’m in love with drafting Magic The Gathering, as the unknown element is what makes it so addictive. You’re always happy to open a powerful card or to draft a deck with some amazing synergies. It’s not only the most fun you can have with MTG, but also the most profitable for Wizards of the Coast as you’ll have to buy your booster packs to be able to play. 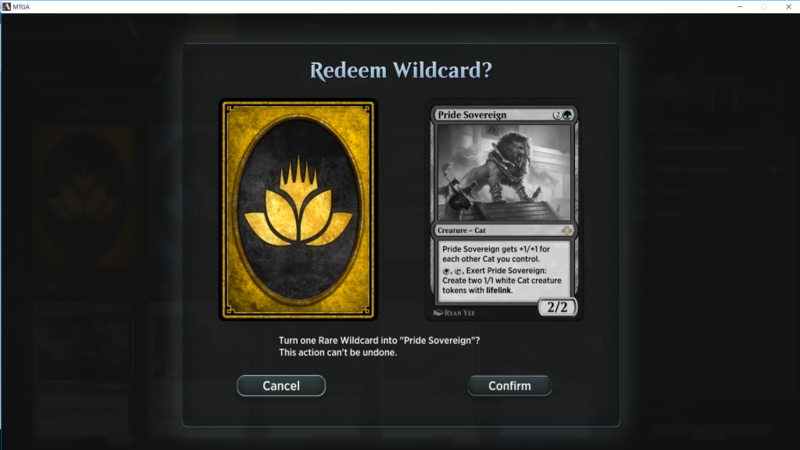 Though I do hape they do away with the added entry prize that they charged on Magic the gathering online. When you open a booster pack you will each time (though this may change in the final release) get a Wildcard. Magic the Gathering has 4 rarities: Common, Uncommon, Rare and Mythic and an equal amount of different Wildcard. You can exchance a Wildcard for any card of that rarity so it will be a lot easier for you to create that specific deck you had in mind. 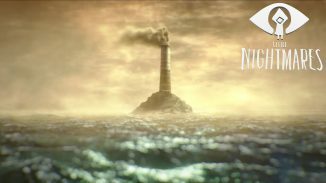 Just like in other digital CCG’s you will also be able to earn gold by completing quests. This gold can then be exchanged for boosters. 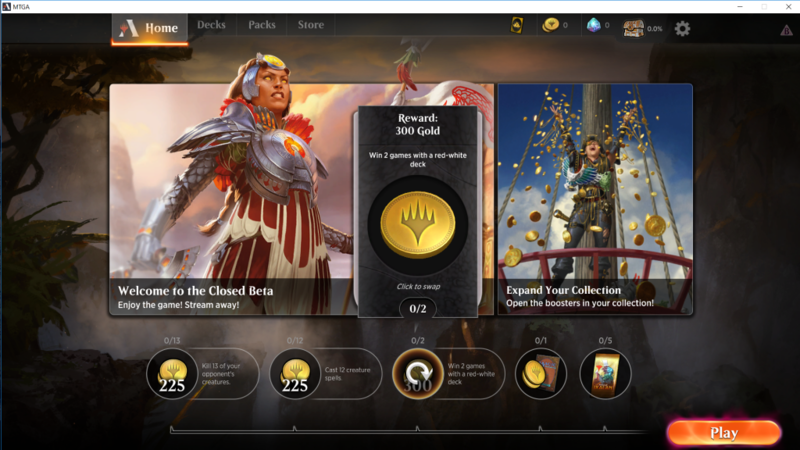 It’s something I’ve always missed in MTG Online and the main reason I check back almost daily on MTG Duels: every day you earn new quests and it’s just too tempting to play a few games every other day just to earn your precious gold. What about the looks though, seems a few steps behind Hearthstone in visual flair, right? Yes, but that’s because MTG can have such huge boardstates. 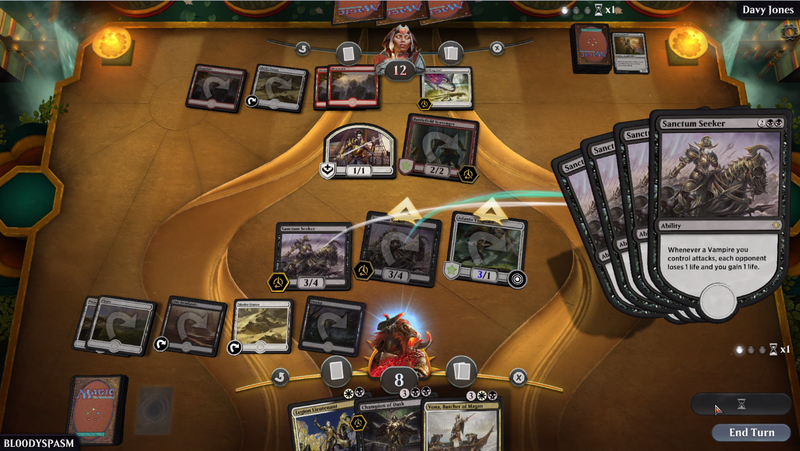 there is no limit to the amount of creatures you can have in play while games like Fable Fortune & hearthstone limit you to 6-9 units on the board. And that’s not even taking into account other permanent types like Enchantments, Artifacts and Planeswalkers. That’s a good enough explanation why the base board looks a bit empty and why the size of the cards looks rather small (and they scale with the amount of cards in play) but it could still used some touches to add to the charm. 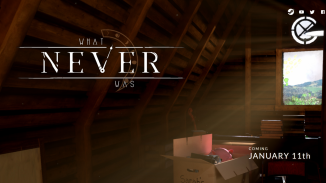 I’m thinking a board that’s interactive (clickable background with some animations), more visual effects and sound effects (which is only reserved to a few cards at the moment). What would really be an awesome addition, in my opinion, is if they let you chat with your opponents (though they should allow muting) so you can come closer to the social aspect that the paper version offers. As for performance: I noticed more lag than when I was playing MTG Online, so I really hope they invest in better servers as the number of players increases. 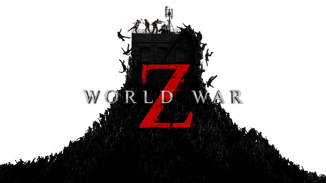 A multiplayer game like this stands and falls by its online performance and while I can forgive a few hiccups in the closed beta: those issues should all be tackled before the final release. Until then, I hope they keep improving on the product, but what is playable today is already a step up from Magic The Gathering online when it comes to its looks and ease of access. The only way is up. I’m excited for the future of digital Magic again!